Following the visit to the Thames Whale exhibition, we decided to make the most of our day in London with some other visits. I knew that there was a photography exhibition on at the British Museum called The Past from Above , so we hopped on the tube to Russell Square and walked to the museum. I don’t think I’ve been there for about 15 years – the last (and only) time I’d been was to see the Elgin Marbles when I was studying Classics at A-level. That meant I’d never had the opportunity to see the renovated Great Hall, with its amazing roof… I was absolutely amazed by it. I realise that in the past few years it has probably become one of the most photographed landmarks in London, but I couldn’t help but reel off a lot of shots. I’d also taken the Pentax ME with me, and managed to finish the film – so I’m now looking forward to getting that developed. The space really is beautiful and the architecture is stunning. Ola didn’t come into the exhibition with me as she wasn’t feeling well, so she and her sister sat in the cafe while I explored. It consists of some fantastic aerial photographs of ancient sites around the world, laid out as a geographical tour starting in Africa, passing through Asia and the Americas and ending in Western Europe (there’s a swathe of Europe that isn’t actually represented, which was a shame). It reminded me of The Earth from Above , but with the environmental slant replaced by a historical one – so there were shots of neolithic structures, ancient temples, Roman ruins, and so on. Highly recommended. As I was coming out of the exhibition, I heard a voice say “Andy?” and found myself talking to a friend who I hadn’t seen for near on 10 years – a surprising, and brief meeting (Becky, hope you find my blog!). This entry was posted in Uncategorized and tagged London, Photography. Bookmark the permalink. 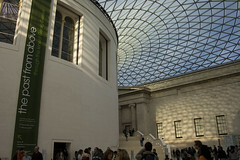 For those of you who haven’t been to the British Museum for a while (or ever) I concur with Andy that it’s a wonderful inner courtyard and that the roof is a joy to behold. Reminds me of Mitterand’s Pyramid in its apositeness.